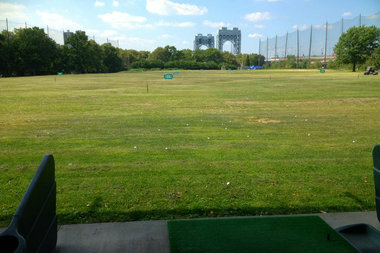 Four men snuck into the Randall's Island driving range and enjoyed a free afternoon of golf, police said. RANDALL'S ISLAND — Four men sneaked into an empty driving range and broke into the ball room for an afternoon of free golf, police said. The men crawled under a fence at Randall's Island Golf Center about 4:45 p.m. on Dec. 8, according to the NYPD. Staff at the center — which is closed Mondays and Tuesdays in the winter — saw the four men head straight to the driving range where a bucket of 110 balls normally costs $14, police said. Nobody at the golf center picked up the phone Monday or Tuesday. Officials at the Randall's Island Park Alliance were unaware of the incident. The men tampered with a golf ball machine to get their balls. When they ran out, they were able to break into a ball room to get a refill, according to the police. Staff told police that they recognized some of the men from the surveillance video, saying they are regulars at the driving range.